The 2017 NCAA season was dominated by headlines of quarterback play across the nation including Lamar Jackson’s hot start in his Heisman defense, Sam Darnold’s rough patch, Baker Mayfield’s run to the Heisman and becoming No. 1 overall pick to name a few. 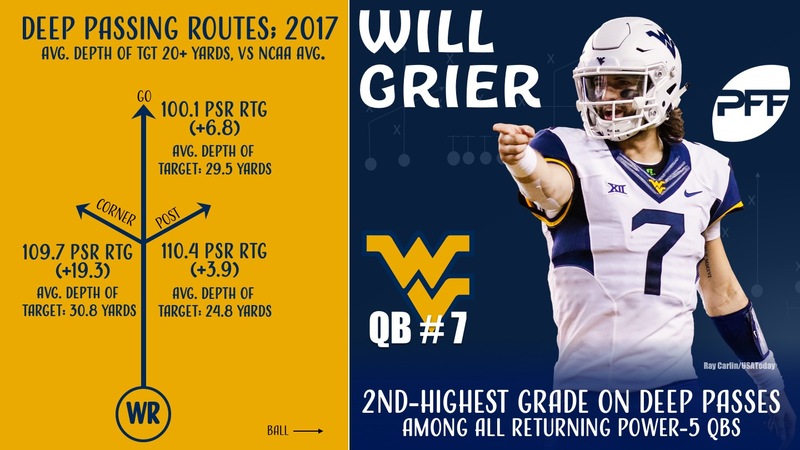 Lesser known outside of Morgantown and the Big 12, another big storyline from 2017 was the dominance of West Virginia QB Will Grier on deep passes. We at Pro Football Focus grade every single player on every single play on every single game at the NFL and FBS level. With our grading on every play, PFF’s database generates a bevy of signature statistics that go a long way at looking past the standard box score numbers. Whether it’s to give a better indication of a player’s performance and prowess in certain areas or whether it’s to compare similar players on aspects outside of those in the basic box score, PFF’s signature stats help formulate our prospect rankings, top returning players and give an overall feel of what to expect in each game moving forward. The deep pass has become a regular occurrence on Saturdays in the fall and only one quarterback from a Power-5 conference returns with a higher grade on such passes than Grier. 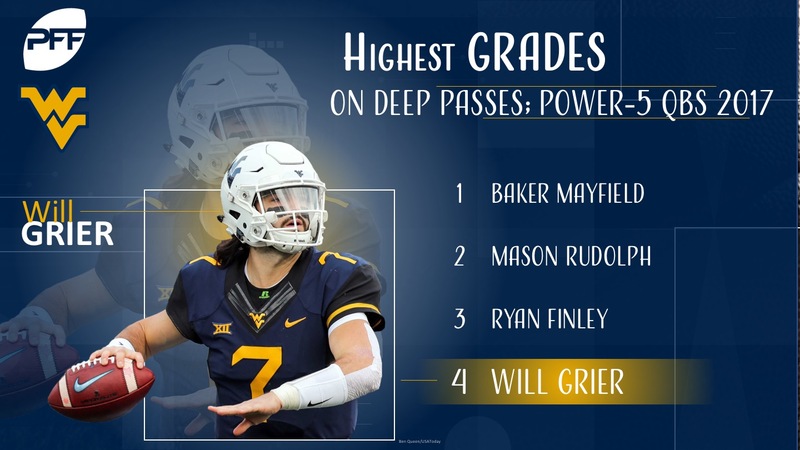 In fact, Grier’s grade on deep passes in 2017 was good enough for seventh in the nation, fourth among Power-5 quarterbacks behind the aforementioned No. 1 overall pick in Mayfield, current Pittsburgh Steelers QB Mason Rudolph and NC State QB Ryan Finley. Grier’s dislocated finger not only ended his season against Texas but also ripped away his chances of setting the PFF College record for most deep passing yards in a season, something he was on pace to do prior to the injury. The race with UCF QB McKenzie Milton was on and it was only because of the injury that it became a one-horse race through bowl season as Milton’s 1,812 deep passing yards led the nation by 100 yards and set the new PFF College record. A deep pass by PFF’s definition is any pass that is targeted at least 20 yards past the line of scrimmage. Grier attempted 97 deep passes, completing 36 of them for 1,506 yards and 16 touchdowns. His numbers actually could have been even better on deep passes, had he not been plagued by 11 drops – a figure that led the nation – meaning 11.3 percent of his deep, catchable attempts were dropped. 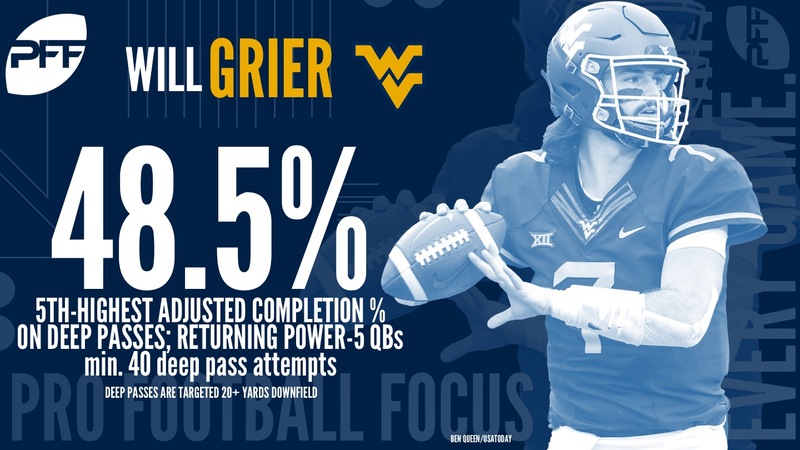 Accounting for those dropped passes, Grier finished 2017 with an adjusted completion percentage of 48.5 percent, which was the 19th-best mark in the nation last season. PFF’s adjusted completion percentage takes into account factors outside of the quarterback’s control to give a true testament towards accuracy on a pass-by-pass basis. For deep passes, it essentially throws out those 11 dropped passes, thus giving a much better picture of what perhaps the basic ‘passer rating on deep passes’ may allude to. Proven by PFF’s data scientists Eric Eager and George Chahrouri, while passes thrown 20-plus yards downfield are not very stable from one season to the next, adjusted completion percentage is a much more stable metric than passer rating, and Grier put forth a much better adjusted completion percentage than he did passer rating on deep throws. So how did Grier throw for 1,506 deep passing yards in just over 10 games in his debut season at WVU? While it is discussed by the aforementioned duo of Eager & Chahrouri, Grier did his fair share of work on throws short of the line to gain. However, he was among the nation’s best when throwing the ball downfield as well. He had three routes average a depth of target of well over 20 yards, including his most-targeted route type, the aptly named ‘go’ route. Grier targeted a fly route on 17 percent of his pass attempts (79 attempts), averaged a whopping depth of target of 29.5 yards and accumulated 1,102 of his total passing yards. Speaking specifically to those three routes targeted over 20 yards downfield, Grier had a passer rating above the NCAA average on all three of them, including a 100.1 passer rating on ‘go’ routes. The 2018 season will once again be a race for the national lead in deep passing yards, undoubtedly between Milton and Grier, who may also battle all season-long for Heisman hopes. Milton and the UCF offense will be under their first season with Josh Heupel at the helm and without their star receiver Tre’Quan Smith (who finished third in deep receiving yards with 649) after he was drafted by the New Orleans Saints. While Grier also loses his top deep receiving threat in terms of yards in White, both Jennings and Sills return as does Marcus Simms who was also a deep threat in his own right, to form arguably one of the nation’s top receiving corps this fall. No matter who he’s throwing to, Grier’s chase for the PFF College deep passing record that eluded him last season should pick back up immediately. He just has the extra leg up with his returning threats. One thing is for sure: Grier’s deep ball performance will certainly be fun to watch this fall.